Jenny Ban Creates: Happy birthday, America! 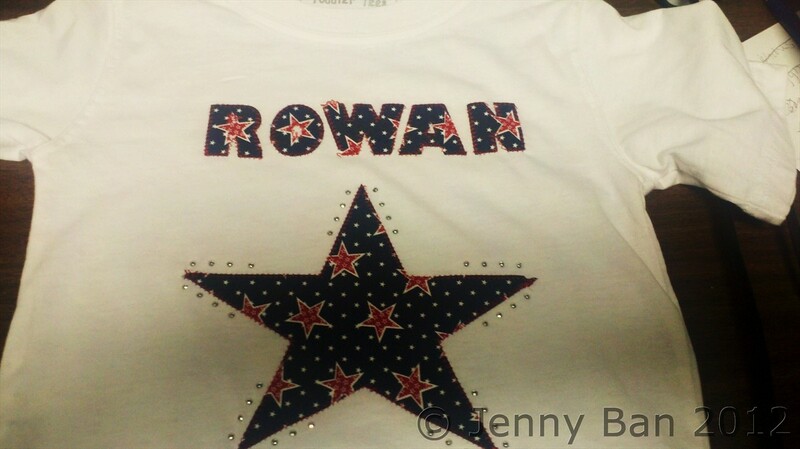 The other day I decided, on the spur-of-the-moment, to grab some patriotic fabric and whip up a few holiday t-shirts. This one is for a friend's daughter. I love using my Silhouette SD to make custom shirts, and they are so quick and easy. Iron some heat-n-bond on the back of pre-washed cotton quilting fabric, cut the letters/shapes on the Silhouette, and then iron them to the shirt. Then I do a nice zig zag around all the edges to jazz it up. I also added some iron-on studs--I love the bling! I hope my kids want to wear theirs on the 4th!